Analog oscilloscopes, which employ cathoderay tubes to display a waveform, were the first oscilloscopes that were used by engineers. The screen’s photoluminescent phosphor illuminates every time an electron hits it. A representation of signal is displayed as successive bits of phosphor light up, while a trigger makes the displayed waveform appear stable. Upon completing an entire trace of the display, the oscilloscope waits until a particular event occurs and begins the trace again. Since the illuminated phosphor does not disappear immediately, the analog oscilloscope allows users to view several traces overlapping each other, providing a glimpse of the irregularities or glitches in the signal. However, an analog oscilloscope cannot keep the waveform for a longer period of time, as it does not have the capability to “freeze” waveforms. Thus, a signal is lost once the phosphorus substance deluminates. Users cannot automatically perform measurements on the waveform. Instead oscilloscope users will have to use the grid on the display to make measurements. Another downside of an analog oscilloscope is the limited type of signals it can display, due to the upper limit on the speed of the vertical and horizontal sweeping of the electron beam. Nowadays, although most people still use analog oscilloscopes, they are, however, not sold very often. The modern tool of choice, digital storage oscilloscopes, or simply known as DSOs, were developed to remedy the negative aspects of analog oscilloscopes. This type of oscilloscope digitizes input signals through an analog-to-digital converter. Its attenuator scales the waveform while its vertical amplifier offers additional scaling whenever the waveform passes through the analog-to-digital converter (ADC). The ADC digitizes and samples the incoming signal, and stores the data in the memory. The time-base adjusts the oscilloscope’s time display while the trigger searches for trigger events. Before finally displaying the signal on the oscilloscope, the microprocessor system performs additional postprocessing specified by the user. With the data in digital format allows the oscilloscope to perform various measurements on the waveform and indefinitely store signals in its memory. Thus, the data can be printed or transferred to a PC through a LAN, flash drive, DVD-RW, or USB. The advances in digital electronic technology resulted to an increasing demand to simultaneously monitor digital and analog signals. 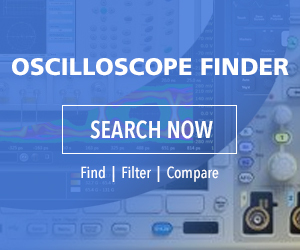 This constrained oscilloscope vendors to come up with another type of oscilloscope — the mixed signal oscilloscopes (MSO). A mixed signal oscilloscope has the ability to trigger on and display both digital and analog signals. It usually features more digital channels than analog channels (two or four). A portable or handheld oscilloscope is a compact oscilloscope that can be carried around. Lightweight and portable, this type of oscilloscope can quickly turn on and off, and are easy to use. However, it does not to offer much performance as its larger counterparts. Generally found in university laboratories, economy oscilloscopes are affordable by does not provide as much as performance as high-performance oscilloscopes, which offer the best performance capabilities available. High-performance oscilloscopes are used by those requiring high bandwidth, fast update and sampling rates, large memory depth and a wide array of measurement capabilities.